LAS VEGAS -- Samsung today announced new Tizen-based Gear S2 Classic smartwatches, placing an emphasis on styling, with traditional round-faced designs that come in 18K rose gold and platinum. 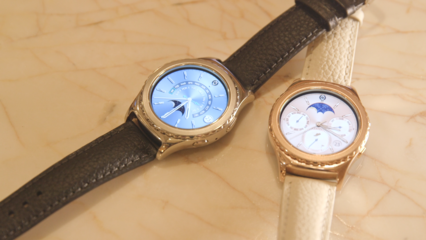 The round-faced Gear S2 line debuted in November with most models selling for $300. Pricing wasn't announced for the coming Classic models. The internal components of the earlier models will remain the same in the Classic versions. The smartwatches will be available in February. The new Samsung Gear S2 classic smartwatches will have a 1.2-in. circular display, a dual-core application processor and 4GB of internal storage. The devices will support wireless charging with a 250 mAh battery that lasts two to three days with typical usage. What makes the new smartwatches noteworthy is Samsung's continued commitment to the Tizen operating system. Earlier Samsung smartwatch models running on Android Wear are retired, at least for now, Samsung officials said. "Tizen gives us more control," said Eric McCarty, vice president of mobile product marketing for Samsung's business products division in the U.S. He spoke in an interview at CES. McCarty emphasized that Samsung is still a close partner with Google on Android for use in Samsung Galaxy smartphones and other devices. The Tizen-based smartwatches also will run with most Android smartphones. Today, there are about 1,400 apps that work with the Samsung smartwatches, a far cry from the millions of smartphone apps on the market. Samsung announced in a press conference late Tuesday that its smartwatches will support iOS devices later this year, but didn't elaborate. That means the Gear S smartwatches, which currently can be linked over Bluetooth to Android phones, will be able to link to iPhones and iPads later in the year. Samsung is also selling Tizen-based smartphones like the Z3 outside the U.S. McCarty said there is no roadmap for when Tizen smartphones from Samsung will arrive in the U.S.
Samsung's ability to attract independent Tizen developers to build innovative new apps could be the deciding factor in Samsung's future smartwatch success, according to analysts. McCarty said there has been steady progress in attracting Tizen developers, but analysts consider the future path for Tizen developers and the OS a tenuous path. In December, analyst firm IDC called Samsung's Tizen the "dark horse of the smartwatch market" and ranked it fifth in shipments in 2015, with 1.7 million devices. Apple's WatchOS, by contrast, was ranked first, with 13 million smartwatches shipped -- taking 61% of the market. Android Wear was second with 15% of the market, and 3.2 million units shipped. IDC said Tizen has benefited from technology developments like new users interfaces, including a round-shaped face with a bezel ring that rotates for navigating through apps and other functions. Still, IDC said, such features won't be enough to keep up with Android Wear and WatchOS. IDC and other analysts are still upbeat about smartwatch growth, although there is widespread recognition that the market hasn't grown as fast as envisioned three years ago. McCarty admitted that the smartwatch market is "moving slower than a lot of people [expected] and certainly than we would have." Still, McCarty said there's a promising future for smartwatches, especially for use in business and industrial applications. For example, Red Hat has developed Tizen-based application modules for work flow, time management and expense management, he said. Samsung and other businesses are working on a number of proof-of-concept projects, including health-related applications, he said. In coming years, it won't be far-fetched to see field-based workers using smartwatches, possibly to allow a manager to track their pace of work and location. Based on feedback from business customers, McCarty said IT managers want to see more smartwatches operate independently over LTE wireless or 3G networks, instead of having them paired with Wi-Fi or Bluetooth. Jack Gold, an analyst at J. Gold Associates, said that smartwatches have so far had "no real impact" in enterprises other than with users who want to be notified quickly they have emails. "Most businesses are still trying to figure out how to best use tablets, so smartwatches are another area they need to explore. To date, it’s unclear how smartwatches are useful to make workers more productive" or give ROI to companies.